Last week’s Gooding & Co. sale, held in Scottsdale, achieved very good results that made it the most successful of the 2019 Arizona sales. The event, held on Friday 18th and Saturday 19th January 2019, recorded a total turnover (commission included) of USD 48.2 million (just a million shy of the 2018 result). The sale rate was 85% — 104 of the 122 cars offered found new owners — and the average value per lot was USD 463.4 K, which was a good USD 15 K more than in 2018. In total, eight cars went for more than a million dollars, some of them fetching several million. In detail, one sold for more than USD 7 million, and two for more than USD 5 million, while one managed to break the USD 2 million barrier, and a healthy five cars each fetched more than USD 1 million. One car, a 1936 Bugatti Type 57 Two-Light Ventoux, set a new world record price for the model, selling for USD 885 K. The car that fetched the highest price at the Gooding sale, and indeed the highest of all three 2019 Arizona auctions, was a 1963 Ferrari 250 GT SWB Berlinetta, which changed hands at USD 7,595,000. It is interesting and important to note that the top six lots at this Gooding sale were all Ferraris. This sale confirms the current strength of the market, where there are plenty of interesting cars offered for sale and many serious potential buyers; even though the prices recorded are 15–20% lower than the levels reached a couple of years back, in many cases they still represent growth levels of +100–120% compared with five years ago. 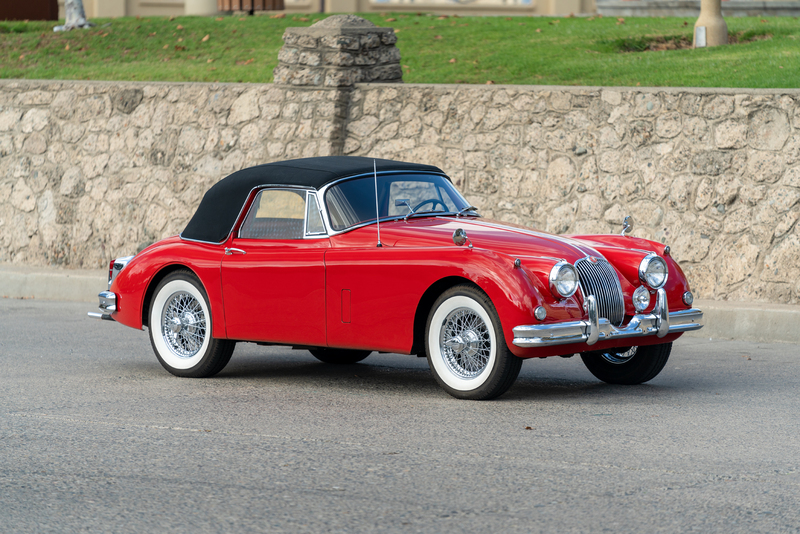 True to forecast, the sale’s cheapest car was a 1951 MG TD (chassis #TD8672), offered without reserve after a complete restoration and a recent refresh, which has spent the past 40 years in the hands of two Arizona-based owners. This car fetched USD 19,040 after an estimate of USD 25–35 K. Remarkably, the collective value of the auction’s top five sellers accounted for almost 50% of its total turnover. 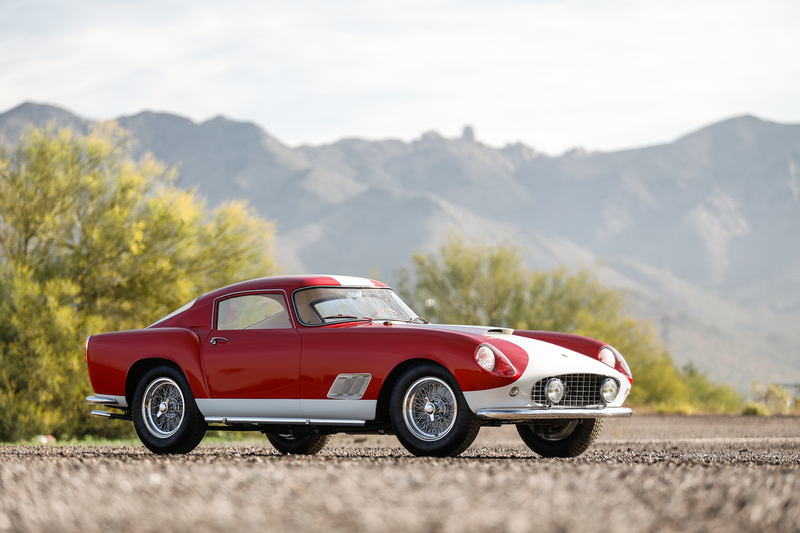 Three of the six cars we featured in our preview of the Gooding & Co. 2019 Arizona auction found new owners, one of them featuring among the Top Ten most expensive lots. I refer to the 1964 289 Shelby Cobra. This is a car that has benefitted from long-term ownerships, having been kept by its first owner for 24 years and by its latest one, the consignor, for 20 years. It sold for USD 1,050,000 after an estimate of USD 0.95–1.1 million. 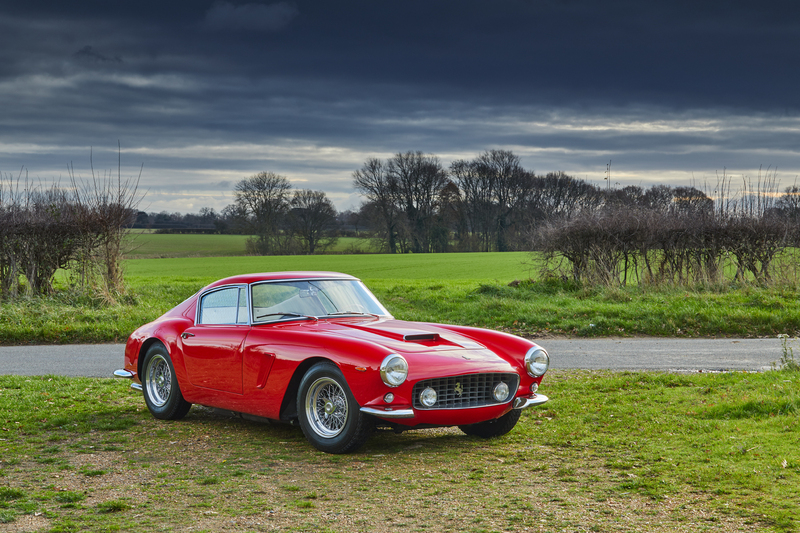 Our selected six also included a 1963 Ferrari 275 GTB Prototype, one of the two cars assigned the highest pre-sale estimate, but it failed to sell (whereas the other top valued car, a 1963 Ferrari 250 SWB, became the event’s top lot). The 1948 Spurgin-Giovanine Roadster, a speed record-breaking hot rod, which reached speeds of up to 123 mph on salt lake beds and featured on the March 1949 cover of Hot Rod magazine, sold at USD 212.8 K, falling somewhat short of its pre-sale estimate of USD 250–350 K, while the wonderfully original 1963 Amphicar Model 770, offered with a history comprising just two owners from new, sold for USD 71,680, a good price perfectly in line with its pre-sale estimate of USD 60–80 K.
Finally, the other two cars we picked out, a 1956 Porsche 356 A Speedster by Reutter and a 1960 Maserati 3500 GT Spyder Prototype by Carrozzeria Vignale, both failed to sell. USD 7,595,000: 1963 Ferrari 250 SWB Berlinetta (chassis #4037 GT). This Ferrari Classiche certified, matching numbers car was the fourth-to-last SWB manufactured, and it was sold new to the USA. It still sports its original color combination of Rosso Cina on black, and it is one of only 96 specimens of this model to feature the Lusso package. It comes with a well-known history. Its final price was towards the top end of its pre-sale estimate range of USD 6–8 million, making it the most expensive car of the entire Arizona Auction Week. USD 5,890,000: 1958 Ferrari 250 GT Tour de France Berlinetta (chassis #1037 GT). This Ferrari Classiche certified car is the 19th of the only 36 “single louver” TdFs built. It was originally delivered in Venezuela (painted in white over black interiors), where it was raced from 1958 to 1960. It was first imported into the USA in 1987, before going to Australia and then, in 1992, to Europe. It has spent the past sixteen years back in the USA, under a single owner. It sold well, after an estimate of USD 5.75–6.5 million. USD 5,395,000: 1953 Ferrari 250 MM Spider by Carrozzeria Vignale (chassis #0348 MM). This early competition Ferrari, one of only 12 competition Ferraris bodied by Vignale as Spiders, was sold new to Alfredo Momo in the USA. Despite being extensively raced in period, it still retains its original chassis, engine, gearbox, body and major components. This Mille Miglia eligible car just failed to reach its pre-sale estimate of USD 5.5–6.5 million. USD 2,507,500: 1985 Ferrari 288 GTO (chassis #ZFFPA16B000055713). Built in a limited number (just 272 in total), the 288 GTO is the model that marked Ferrari’s return to the field of top-performance supercar manufacturing. This specimen was originally delivered in Italy and, immediately afterwards, exported to and federalized for the USA. It has had three owners from new, who have always kept it well preserved. It has indeed been extensively shown but little driven, with the result that it has covered, in total, a mere 12,249 kilometers (or 7,605 miles). This completely original Ferrari Classiche certified car just exceeded its lower estimated value: it had been expected to sell for USD 2.5–3 million. USD 1,930,000: 1952 Ferrari 212 Europa Cabriolet by Pinin Farina (chassis #0235 EU). This matching numbers and Ferrari Classiche certified 212 was Ferrari’s stand car at the 1952 Paris Auto Show and the 1953 Brussels Motor Show, and its racing history includes 9th overall and 3rd in class at the 1st Nürburgring 1000 kilometers. It was restored in 2012 by Ferrari Classiche itself. Expected to fetch USD 1.9–2.2 million, it did very well, exceeding its lower estimated value. USD 1,902,500: 1963 Ferrari 250 GT Lusso (chassis #5141 GT). Built in late 1963 and registered in 1964 through the Ferrari official dealer in Turin (Garage Fontanella), this matching numbers car originally had a red on black color scheme, but by 1971, when it was exported to the USA, it was already sporting silver paint. It has a known American history, including the past 10 years in the ownership of the seller. It sold well above its estimate of USD 1.6–1.8 million. USD 1,435,000: 1955 Mercedes-Benz 300 SL (chassis #198.040.5500378). This matching numbers car, originally equipped with Rudge wheels, was originally ordered new by the famous Austrian conductor of the Berlin Philharmonic Orchestra, Herbert von Karajan. He kept it for a relatively short time, and it has indeed been with a single American owner since the early 1960s (certainly since before 1964). Well preserved following an early 1970s restoration, it had not been seen in public since 1984, having been kept “stored” in a dry barn. It sold above its estimated value of USD 1.1–1.4 million, and Mercedes-Benz Classic of America has already announced that the new owner has asked them to perform a perfect restoration of the car. USD 1,050,000: 1964 Shelby Cobra 289 (chassis #CSX2246). This car was the only one of our selected six to make it into the Top Ten, and it is described in our preview. 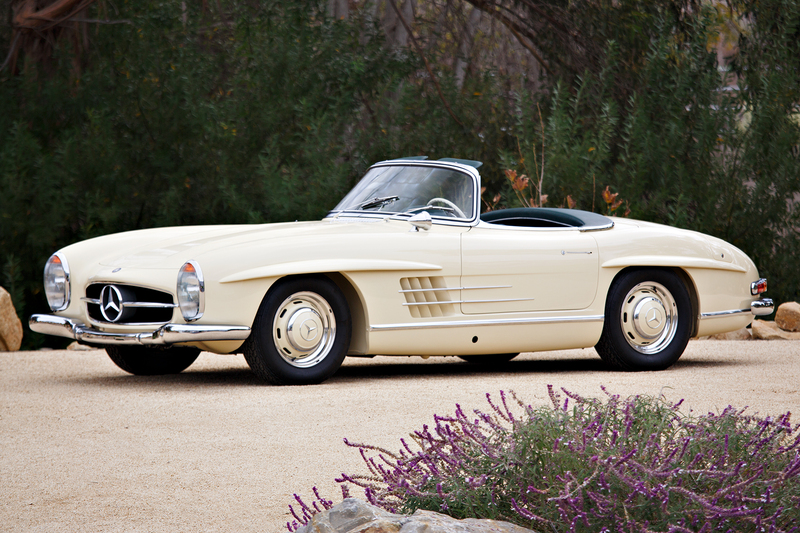 USD 1,006,000: 1957 Mercedes-Benz 300 SL Roadster (chassis #198.042.7500229). This car, with three owners from new, including one ownership that lasted for more than 50 years, was offered still wearing its original color combination of Elfenbein (a yellowish beige) over Grün (green). It was one of the first 300 SLs to enter American soil, having been delivered just two months after the unveiling of the model. A matching numbers car, restored about six years ago and featuring a fresh mechanical overhaul, its hammer price perfectly matched its estimated value of USD 0.9–1.2 million. USD 912,500: 1965 Shelby 289 Cobra (chassis #CSX2448). Coming from a more than 40-year single ownership and boasting a well-known history, this car, perfectly restored by a Cobra specialist, is documented as one of the few (around 30) Cobras independently prepared for competition. It had been assigned a pre-sale estimate of USD 0.9–1.1 million. 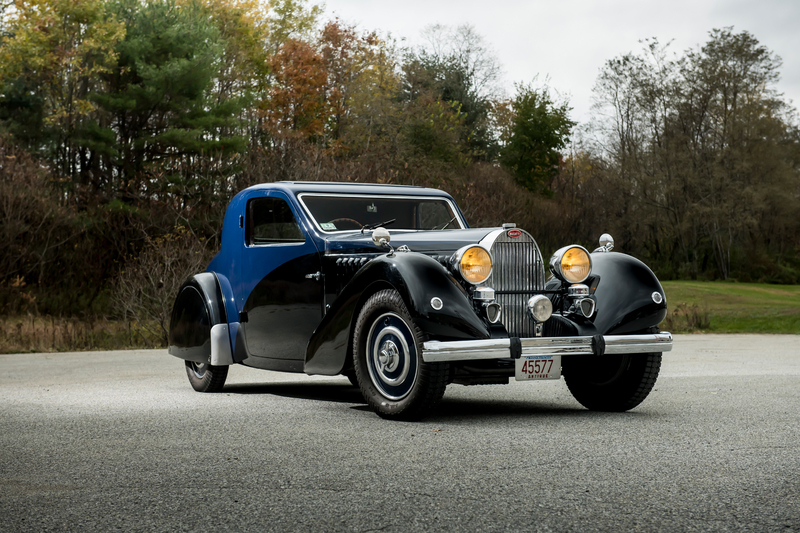 The Gooding & Co. sale included a 1936 Bugatti Type 57 Two-Light Ventoux (chassis #57469), the last of the only six 57s with a “Two-Light Ventoux” body ever built. It was delivered new in France, and its entire history, from day one, is well known. After surviving the war in France, it was exported to Belgium in 1957, and from there it soon made its way to the USA, where it has remained ever since. It has been shown at several concours events in the last decades, including the 2009 Pebble Beach Concours d’Elegance. Still complete with its original Jean Bugatti designed body and matching numbers engine, it was offered for sale by a respected Bugatti enthusiast with an estimated value of USD 0.9–1.1 million. It sold for USD 885,000 and therefore just failed to reach this value range, but it nevertheless set a new world record price for the model. Another interesting car crossing the block was a 1961 Jaguar XK150 3.8 Litre Drophead Coupe (chassis #S838766DN), one of the only 79 built in this final year of production. It was offered in completely preserved condition and with a history showing only two owners from new. It was imported new into the USA and sold in Indianapolis, as a young man’s graduation gift, and it remained in the same family for 47 years, during which time it was well taken care of and driven with respect. Its second owner, who purchased it about ten years ago, has kept it equally carefully. It was shown in the Preservation Class at the 2008 Pebble Beach Concours d’Elegance. Still with less than 41,000 miles covered from new, it was offered without reserve with an estimate of USD 125–175 K, and was sold, after some very fierce bidding, for the excellent price of USD 212,800. 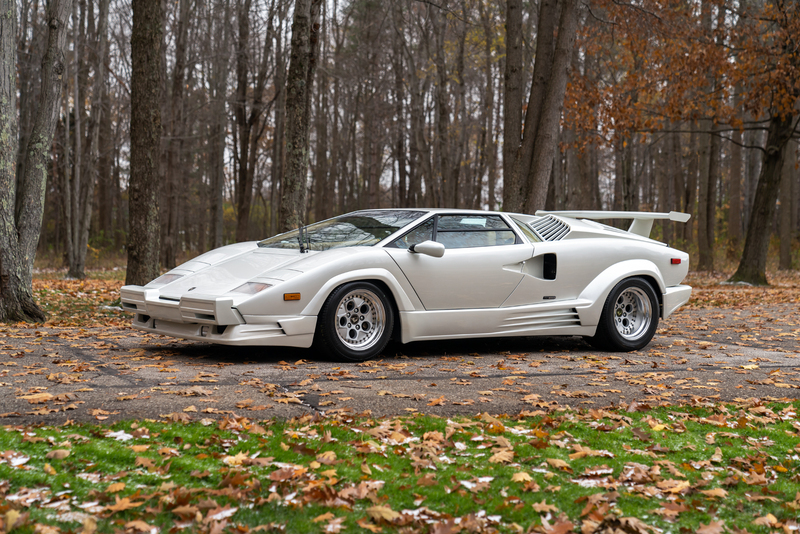 Another car worth mentioning is a Lamborghini Countach 25th Anniversary with Bertone coachwork designed by Horacio Pagani, the last version of the legendary Countach series, first unveiled in 1971. The car offered, a 1990 specimen in Pearl over tan (chassis #ZA9CA05A4LLA12899), was originally sold in Canada and has clocked up about 12,000 kilometers (approximately 7,600 miles). This car, complete with a rear wing, has lived a pampered life and has just undergone a full service. It was offered with an estimated value of USD 275–350, which it just failed to reach, selling for USD 274,400.